Feature, features and more features! 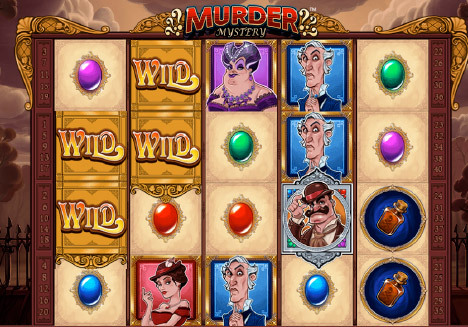 Murder Mystery is a 4 rows and 40 paylines slot game at Fly Casino. This murder/detective themed offering can via web, download and all devices including iOS and Android. Murder Mystery is set against an old English countryside manor with cartoon style symbols on the reels include red, blue, purple and green gemstones, poison bottles, knives and guns. You will also see 3 murderer characters (man, big lady and elegant lady). In the Weapon Spin, you will spin to reveal the murder weapon – up to 12 question marks are added to the reels only on reels 1, 2 and 3, which then transform into the same murder weapon to give you a winning combo. The murderer will be revealed. Up to 12 question marks are added to the reels on reels 1, 2 and 3 – again, they transform into 1 of the 3 high value murderer symbols. Feature Select is the biggest of the features and is triggered when 3 or more detective scatter symbols land anywhere on the reels. You then get to choose from 4 bonus features. Reveal Spins feature – 3, 4 or 5 scatters will reward you with 6, 8 or 12 free spins. Up to 12 question marks will appear on every free spin which then all transform into a randomly chosen symbol (including the wild). Medium variance option. Clue Hunt feature – here you go on to the hunt for murder weapons in the garden. You will see a screen with 12 question marks – you then pick which each murder weapon giving you a cash prize. Poison bottles give you 1 times your stake, knives give you 3 times your stake and guns give you 6 times your stake. You carry on picking until a puff of smoke is revealed – the total cash prize for each murder weapon in then subject to a 10x multiplier. Medium variance. Multi Spins feature – 3, 4 or 5 scatters will give you 12, 16 or 25 free spins. With all wins subject to a 3x multiplier, the Murder Spins feature can be randomly triggered meaning you can get up to 12 question marks on each free spin which then transform into a randomly chosen symbol. 77% Bonus! On Sunday from 00:00GMT until 23:59 GMT, all members on their deposit of just $/£/€30 or more will receive a 77% bonus up to 77.00. Double $75’s Monday! From 00:00GMT until 23:59 GMT, all members on their deposit of $/£/€30 or more get a 100% bonus up to $75.00. Claim 2X.